Energy efficiency means “the energy service provided by the appliance per unit of energy consumed”. For example, in a Fridge, the energy efficiency means its freezer cooling capacity (Output) per unit of current ( input) consumed. In the case of Air conditioner, it is the space cooling per unit of current. 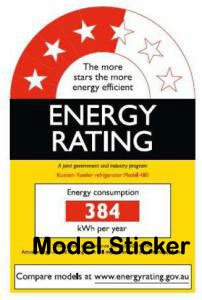 The sticker also shows the unit of current consumption per year. For example, in a 3 Star fridge, it shows 567 units per year. That is 1.5 units per day. In 4 or 5 star category, it again decreases. The energy sticker shows the following details in the descending order from top. The Star rating system has a 1 to maximum 6 starts with a half increment (half of star not colored). To fix the star, various Algorithms or equations are used to rate Star 1. Then its multiplications are used for other star rates. According to 2014 star rating, most energy efficient appliances are 3 and 4. In some appliances, there is 5 Star which is more efficient. The Star rating of Fridge is mainly focused on the Freezer compartment. That is ,maximum freezing time in the desired temperature with less input power. The chart below shows the standards of Fridge in which the freezer temperature is maintained constantly for long period. As the Star rating increases, you can see the decrease in temperature with same input of current. The condition in Air conditioners is slightly different. Since a large area is cooling, it depends on many factors. Higher the Star rating ,it gives more efficiency. As a rule, an extra star will reduce the running cost by around 10 % per year. But this depends on the use. In Split AC, there are two types. The tube connecting the indoor unit with the outdoor compressor may be Copper or Aluminium. Even though Copper type cost high, it is better for more effective working. Sealing the gap between the windows and doors, air holes, removing unnecessary furniture from the room etc will give efficient cooling. Setting temperature between 23-26 degrees will ensure a comfortable cooling without much energy. The running cost increases up to 10% each time when we lower the temperature by 1 degree. Presently as per BEE Regulations (Bureau of Energy Efficiency) room air conditioners are rated on the basis of their energy efficiency on a scale of 1 to 5 stars. Higher the number of stars, the higher is the energy efficiency of the room air conditioners and vice-versa. The chart below shows the variations in efficiency units.